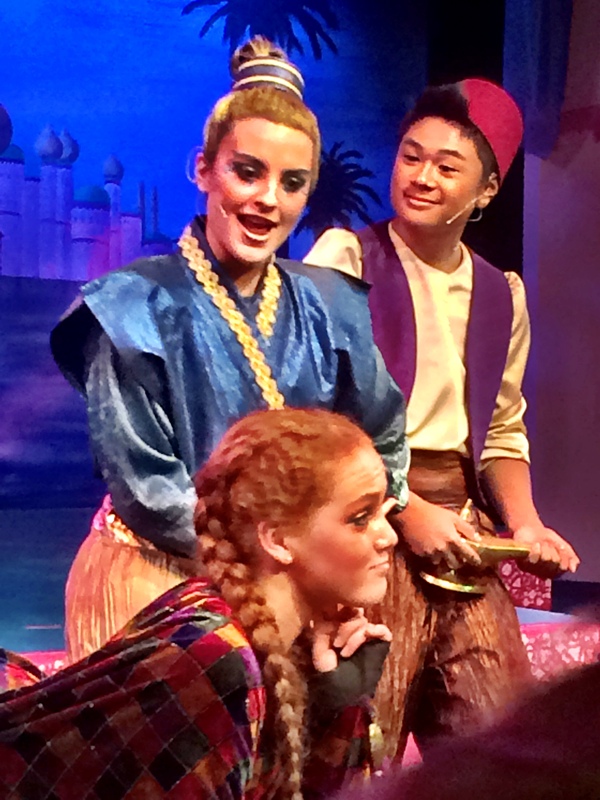 Conejo Theater for Everyone – Aladdin Jr.
A few weeks back I reviewed the Young Artists Ensemble (YAE) in their production of Aladdin Jr. for Chillin’ in the Conejo. You can see that review HERE. Tonight I went back for the opening night of the same play with some remarkable added cast members from Conejo Theater for Everyone (CTFE). CTFE is a collaboration between YAE and the Conejo Recreation and Park District’s Therapeutic Recreation Unit where young actors and actresses with disabilities join in the fun. They really did an awesome job together. The nearly sold out opening night crowd was engaged from the opening scene and it added to the fun of the show. 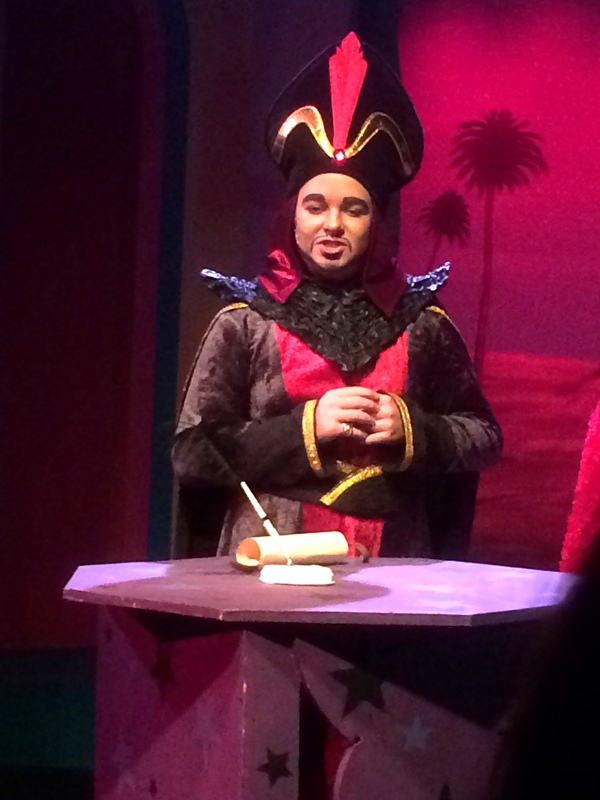 Presiding over the events this evening was Luis U. Tirado as the Sultan of Agrabah. This young man is totally cut out for the throne. His regal repose and firm command were in full effect. Plus, he looked great in the suit! My favorite new player for this production was Shannon Murphy. She played the evil Jafar’s parrot sidekick Iago, and was spot-on with the wisecracks. Rather than wearing a parrot costume as was done in the YAE show, she worked with a larger-than-life parrot puppet that I thought added a fun comedic element. She was really funny. Razoul, the enforcer for the evil Jafar, was also well-played by Brianna “Breezy” Johnson. She has a rather Stentorian delivery, so she barks out orders quite effectively. She has a tough job having to supervise a bumbling staff of evil guards. Joining the troop of guards this evening was Harold “Hoppy” Munz. He has a great scene in the cave where they have imprisoned poor Aladdin. Munz’s timing on his lines adds humor to the scene that was accentuated by how his fellow guards played off him. There was some chemistry here that I really appreciated. As anyone who has seen this play knows, the singing is really spectacular. The song leaders for the ensemble are the story’s narrators. This evening the narrators included new actresses Miranda Berenstein, Brooke Baldauf, Megan Tresback, and Erin Schleich. They all performed very well and sang their solos with confidence and skill. They are front and center in a number of scenes and all did a fantastic job of setting the scene for the play. The one added cast member that I thought might have had the most fun tonight was Cassie Leas, playing the baker. First, she’s adorable, and her smile could light up the whole theater. She shined in the closing number and I don’t think anyone in the theater missed it. When all the bows were done, the whole cast of the show was treated to a well-deserved standing ovation. It’s remarkable enough that the Conejo Valley has such fine youth theater opportunities, but the Conejo Theater for Everyone program is really something special. The fine young actors and actresses obviously put their hearts and souls into the production and it showed. As a community, we should all be proud of them. We should also applaud the YAE mentors who “traded places” to help the CTFE performers to hone their craft as they moved into their former roles. Friends, this is Conejo character! 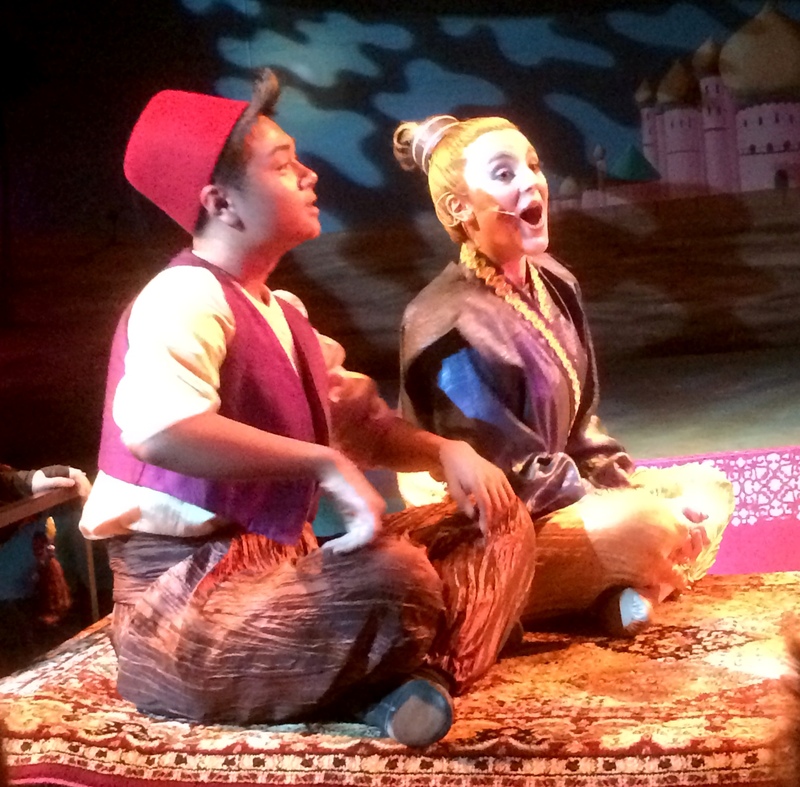 Conejo Valley’s Young Artists Ensemble Rocks Aladdin! “Welcome to Agrabah”…a group of young performers in Arabic garb welcomes you to the fictional Arabian city as you enter the Hillcrest Center for the Arts in Thousand Oaks. Once in the theater, you are transported to a market square outside the palace of the Sultan where Aladdin begins his adventures with petty crime, magic lamps, flying carpets, evil schemers, and a lovely princess. With the help of a well-caffeinated genie he learns the pitfalls of dishonesty, the value of being himself, and how to win the heart of a princess. I really enjoy local theater, and we have some great performance companies in our area. With a stepdaughter involved in local youth productions, my wife and I have been attending a number of performances with these young performers. I can tell you that they work as hard as any actor or actress out there, spending hours upon hours together perfecting their art and learning the ropes of the theater. The end result is a play that is as well-rehearsed as any local show. 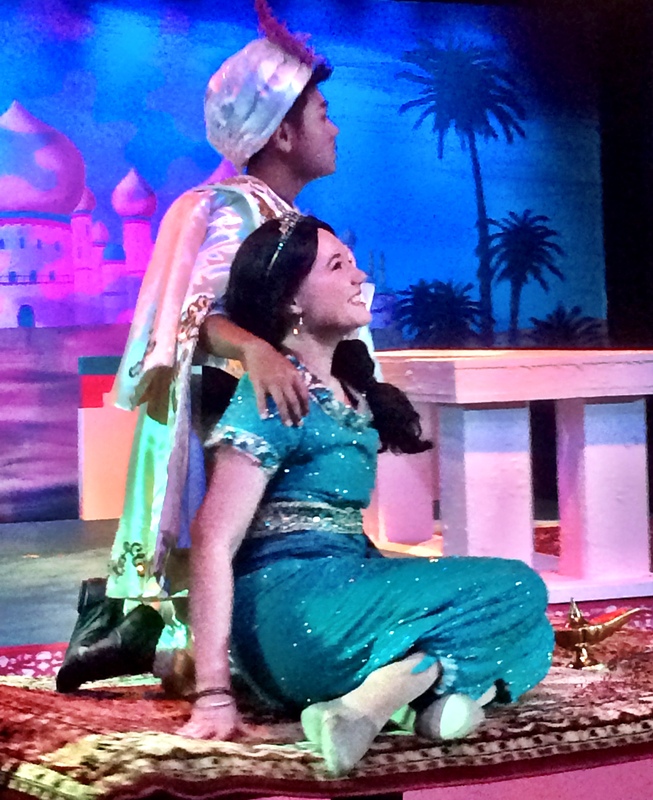 You are all probably familiar with the story of Aladdin, but we recommend that you come see this presentation of the classic tale and enjoy the work of some very talented young artists. 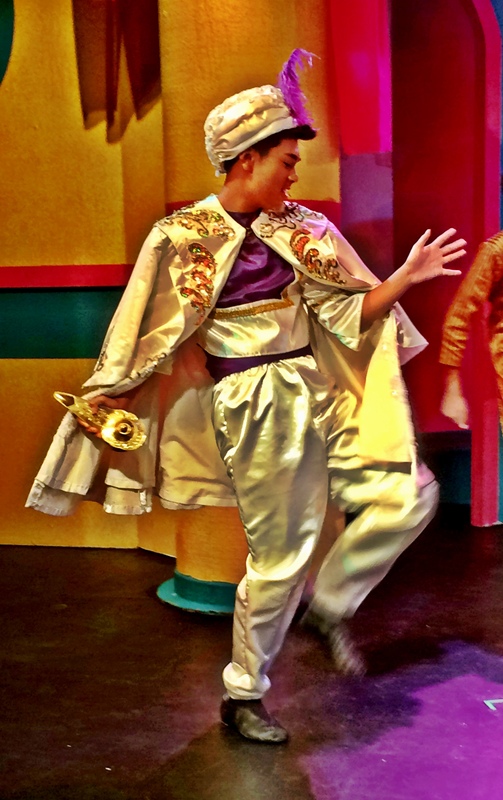 First, Aladdin is well cast in Gabriel Vernon C. Nunag. He has a certain poise that lies somewhere between Justin Bieber and Elvis Presley. His outfits help in this area as well (see photo). He can croon with the best of them, and he never gets away from his character’s naive sense of discovery, be it with power, money, or girls. 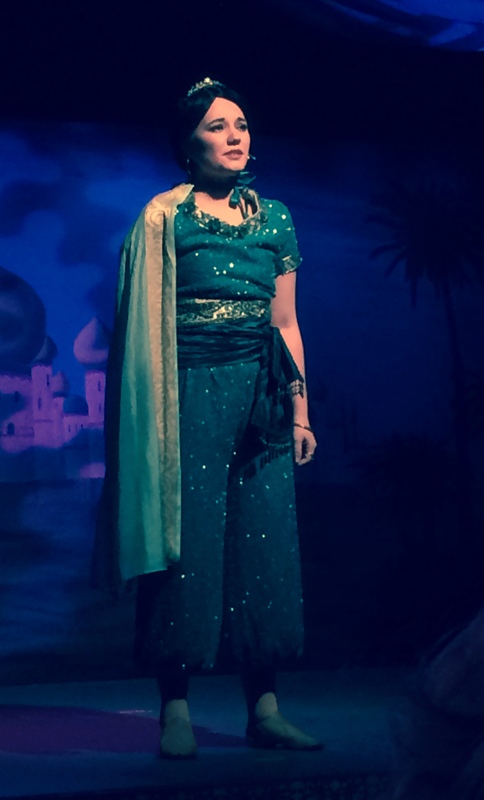 He plays opposite Kate Fruehling as Princess Jasmine. She carries several musical solos with confidence and grace. I felt most engaged with her work in the “Whole New World” duet with Aladdin. Chemistry. Power. Besides the main lead roles, there were some standout performances from the other cast members. The dynamic duo award from me goes to the Genie, played by Mariah Tobin, and the Magic Carpet played by Allison Zatlin. They are the heroes that never made it to Super status, but seem content to be as helpful as they can, and always with a smile on their faces. Tobin has a big stage presence and her character is all about the show part of the show. Her part is funny and she does the comedy well. 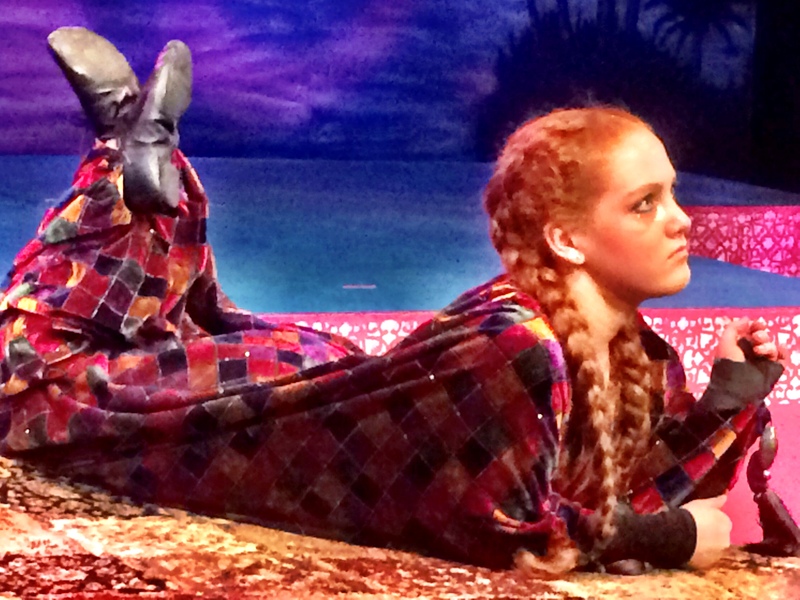 Without any actual lines in the play, Zatlin, as the Magic Carpet, says everything she needs to say with an enthusiastic combination of facial expressions, body language, acrobatics, and effervescent charm. Without a word, we know what she was saying. Another standout is the evil Jafar (Kyle Warner). Warner plays a bombastic, yet ultimately dopey, villain with a propensity for self adulation and a gift for interpretive dance. If he did Shakespeare, he could be a great Prince of Aragon. There are few things funnier than a big villain doing soft-shoe, and Warner nails it. A few random thoughts: For a moment I had this thought that it would be really funny if the Sultan (Cameron Ivan Love) channeled Peter Cook from his famous role as the “Impressive Clergyman” in the Princess Bride. That thought only lasted a second, but it would have been really fun to do that with this role. I guess I can say that since I didn’t actually see the Aladdin movie. Props to Cameron though, a fine Sultan. I also really liked the opening scene for Iago the parrot (Mackenzie Dunton). For me, the squawks are like a cowbell. “I’ve got a fever, and the only prescription is MORE COWBELL“. Thanks for making me laugh :). The remaining cast were all very well rehearsed and played their roles with enthusiasm and skill. The show’s Director, Suzanne Tobin should be proud of the entire group. It really is a great show. 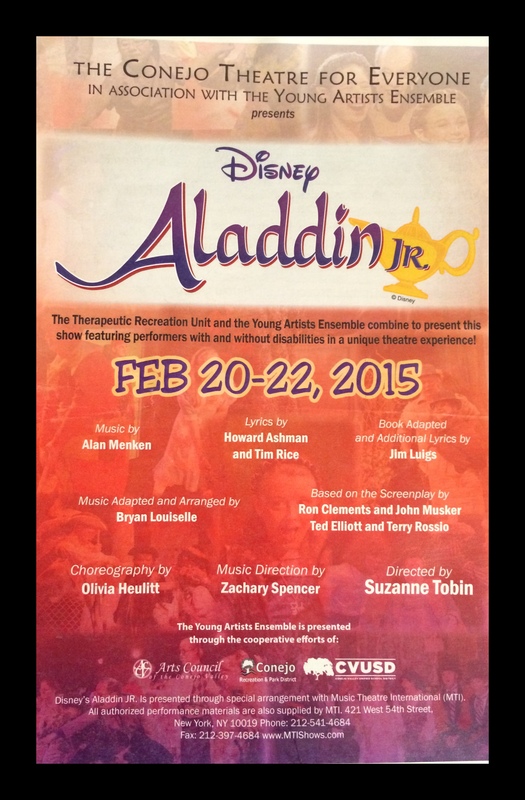 Young Artists Ensemble will be performing Aladdin Friday-Sunday through February 15th at the Hillcrest Center for the Arts. Tickets are available at http://www.yaeonline.com/YAETicketsPage.htm or call (805) 381-1246. I like Brian’s enthusiasm. It’s infectious. No…..really……being around a positive soul is good soup. Brian’s experiences as a Deadhead is who he is. Deadhead is an angle of him. If you look at him through a different angle you still get the same results. What makes Brian interesting is how many angles you can view him from. Each angle is a piece of a whole. Sometimes in our frantic lives we look at pieces but not wholes. For so many of us we never get the chance to see the whole of life. I’d like to present another angle of Brian. An angle that takes place before Jerry’s death but after we were undergratuates. Brian, A.J. and me are low hanging fruit. 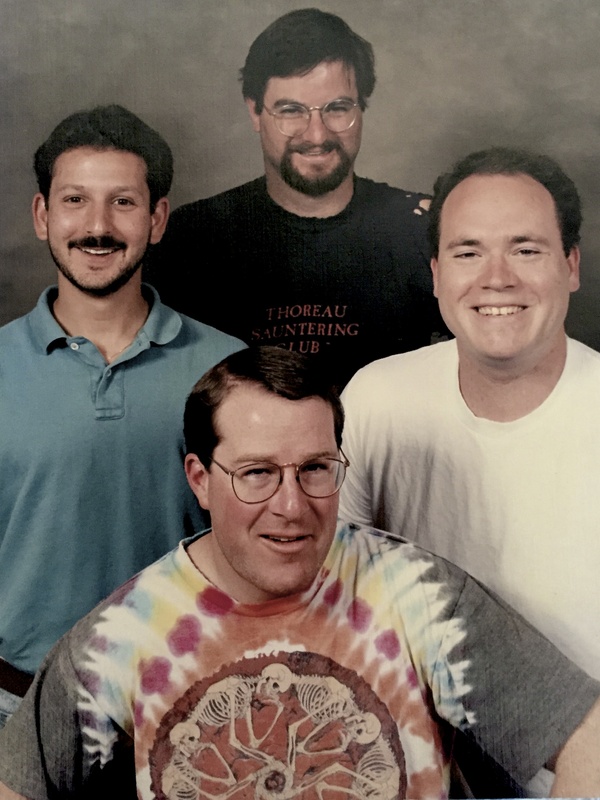 It’s upwards of 26 years I’ve known them. They have been a part of my conscience for over a quarter of a century. I met them through Alex who was the drummer of their band. A.J. and me also know each other from a creative writing course. I showed up at Brian and A.J.’s house to see Alex drum and there was A.J on guitar and Brian on bass. A.J. had bought a raffle for a charity and won a free portrait. On a sunny Spring Sunday in San Luis Obispo, Brian in tie-die, A.J. in a t-shirt, Whitney (a.k.a the Demon Weed) in the back and me on the left, found ourselves in a motel room having a group portrait taken. All the details allude me. How we got there, what we were thinking and feeling. Brian and A.J. had hair. Whitney looks mischievous, and I look twelve with Jew hair. Less then a decade later A.J. 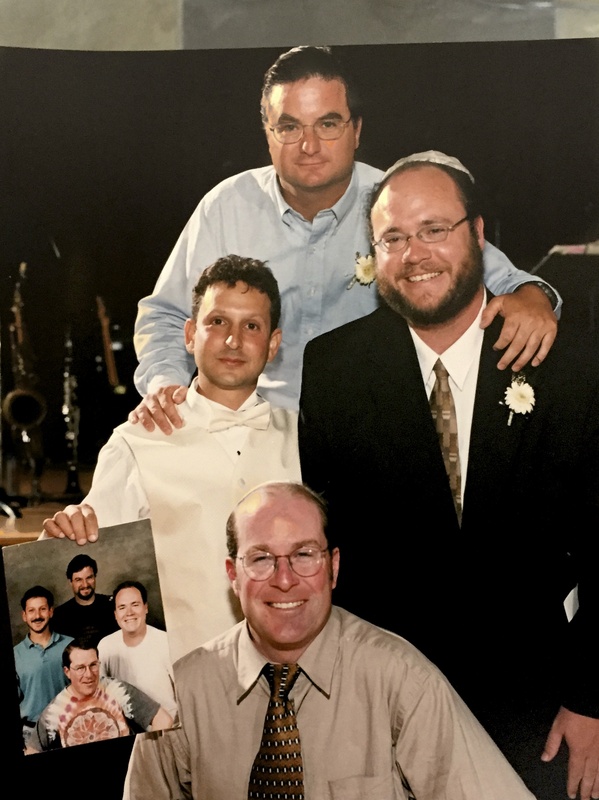 produces the portrait at my wedding, and the four of us take another group portrait with me holding the original. And although there are the noticeable physical differences, we are still the same four with the same shared experiences with the same reasons to smile. After the picture was taken we walked across the street and sat in a restaurant bar having margaritas and salsa and chips before noon. We probably laughed about the portrait and we probably drank and we probably did whatever it was we did. Periodically we reminisce about the original portrait, trying to fill in gaps where most of the details are forgotten. Brian, in his always effervecent way keeps the memory positive and full of laughter; A.J. tells the story like a journalist, loud and boisterous, and I tend to be an idealist, looking for meaning in the span of time passed between both photos and the time passed now. The original portrait is on my bookshelf. The wedding portrait beside it. And beside that perhaps a third photo documenting the span of at least thirty years.